All about nothing is a Dutch movie which invites you to transcend the daily rat race by taking a radically different view on life. This ancient Indian philosophy is called non-duality and has been embraced by the likes of Albert Einstein, Eckhart Tolle, Jim Carrey, Ramana Maharshi and Byron Katie. When this insight strikes, your whole life can change drastically… while nothing has to change. The movie was made out of passion by 86 people who participated. Therefore we were able to make 'All about nothing' with zero budget. It all started as a joke and meanwhile the movie became a success and was on national television twice. We had the movie translated, so it is now available with English subtitles! It has become a great film about non-duality, expressed simply and beautifully filmed! 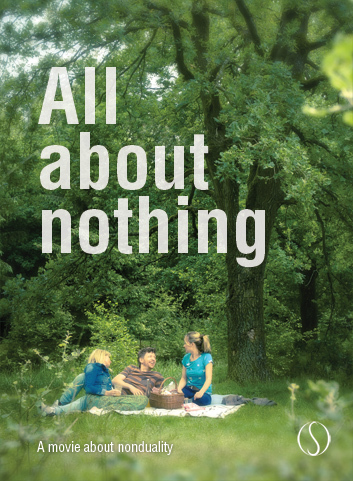 On Wednesday April 3, a new Dutch film entitled All about Nothing (“Alles over niets”) will be launched. Using quite an uncomplicated approach, it presents the possibility of abandoning modern society’s daily rat race by viewing life from a completely different perspective. This is called non-duality and is rooted in Indian philosophy. The movie - starring Steve van Dam, Natasja van Tilburg, Fleur van der Kieft, Guido Weijers and Julika Marijn – gives simple insights into how life can be joyful again, instead of problematic. The film aptly addresses our present-day individualistic consumer society; in which many people are constantly seeking ways to fill an apparent emptiness in their lives by pursuing material gains and buying things. But the resulting satisfaction tends to be short-lived. Recent research has revealed that ‘feeling empty’ is the most common complaint among employees suffering from burnout. Furthermore, nowadays people are often very concerned with maintaining their self-image, which generally leads to either overbearing or pleasing behaviour. The desire to control everything reigns supreme and any deviation from the planned course of life gives rise to frustration, worry and stress. The film demonstrates new perspectives that allow for: a more relaxed attitude, greater vulnerability and an enhanced ability to enjoy the present. The All about Nothing project could not have been accomplished without the passion and commitment of 86 volunteers. These people gave their all for the film, the book and the extra DVD. This project is living proof that it is indeed possible to create something beautiful by working together selflessly, driven by passion and enthusiasm.